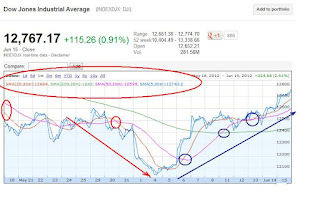 This article is continuation of Where is Dow heading next week ? 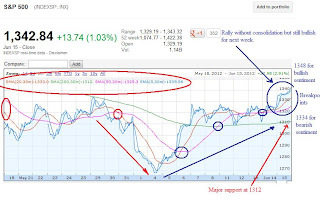 Lets analyse how Dow performed last week: It was expected to be very volatile week because of the weekend Greece election. 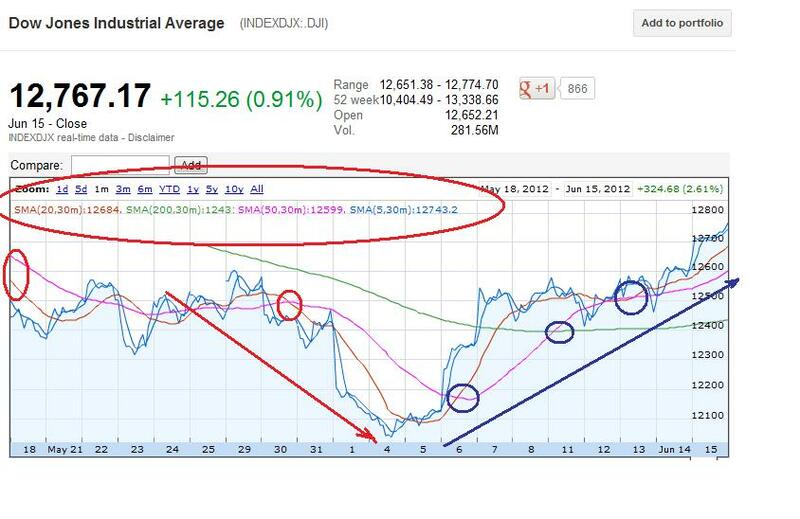 If you look at the above chart, 12422 in Dow and 1309 in S&P500 were 200 Ma. If the stocks had broken this level, market was expected to drop atleast 4-5%. But it didnt happen and market rallied after the rumor that Central bankers are ready to print more money for this market on Tuesday. Friday was the most important date as lot of sell of was expected ahead of Greece election. But if you look at the chart, volume at the open was up 4 times then normal for the week and even the closing volume was twice the normal. This made sure that market won't sell off no matter what happened to Europe. The chart for Friday wasn't normal. Technical levels to watch next week: For bullish sentiment to continue, Dow needs to break 12,865 and S&P500 needs to bre ak 1348. 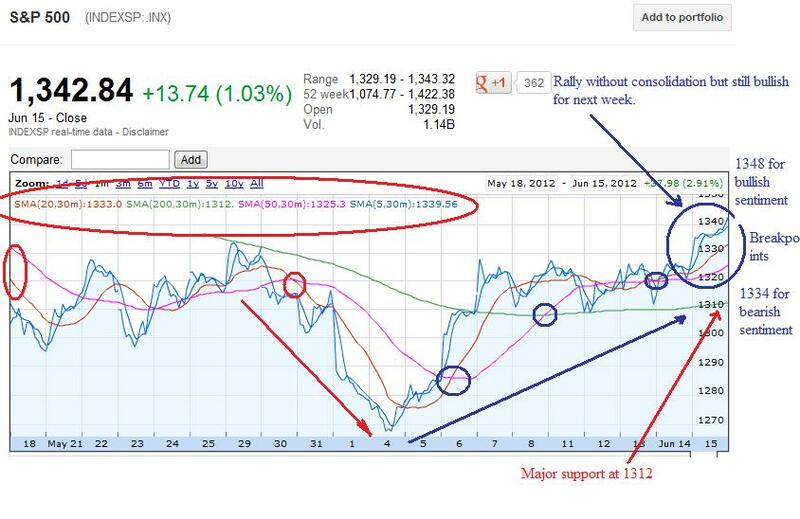 For bearish sentiment to continue, Dow needs to break 12679, and S&P500 needs to break 1339. We could see another 100 point upside this week. 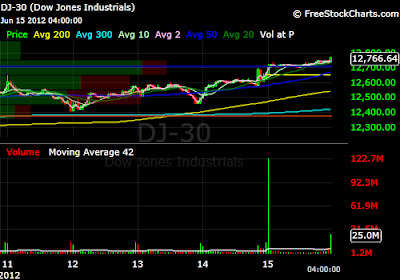 If this market doesn't get QE3 or free money from FOMC meeting or Central banker expect a 600 point sell off. Red circle is bearish sign, while blue is bullish sign. Remember : Expectation from FOMC meeting and central banker to print money are very high. Weak economy data is supporting easing or some policy change as operation twist will be over at the end of June. If the market is disappointed then we should get sell off. 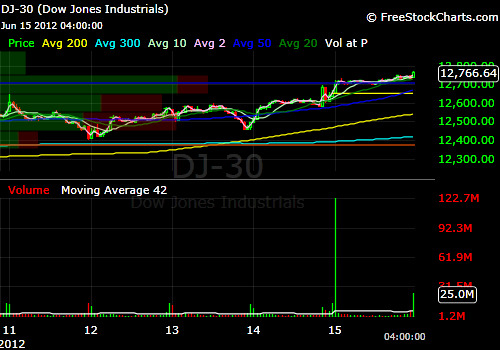 If market get QE next week Dow should be above 14000. Except Tuesday when ECB conducts fine tuning operation, I am bearish for the rest of the week. I expect Gold to sell off.